"Had I not been born in the United States," Boulos said, "Me and my mother would be dead and, being the first born child from a complicated pregnancy, my other 5 siblings would not have be born." QUESTION: What happens when a Haitian mother has the financial ability to go to another country where there is a better health care system to give birth to a their Haitian child? There is nothing wrong with using one's financial resources to assure one's well-being. Being born in the USA and not denying the Haitianness within, is a blessing and the best of both worlds. I'm hoping that Dr Boulos uses his good fortune to help his Haitian Brethren attain his apogee. And, it's never too late to start. 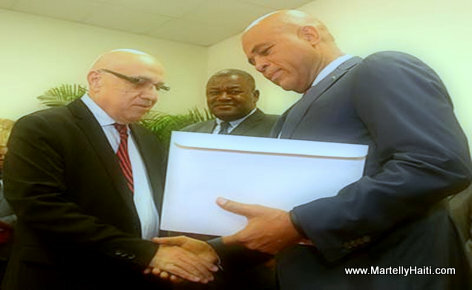 With all due respect, doctor Boulos has been involved in the haitian so-called health care system for over three decades, has always been a favorite of Haitian governments, why couldn't he being a technocrat and health care expert put together a comprehensive plan for building an upscale-world-class-state of the art hospital in Haiti? That would be no problem for a man of his stature, meaning money wise. He wouldn't pursue such venture because he has never looked at the poor Caribbean nation as his home country, but as a hub for quick cash. It's unfortunate, if not sad, if he has a heart attack, by the time to embark an airplane to Florida, it would be way too late. I am a fiend of capitalism. If your parents are from Haiti, but had you in China, does that make you Chinese? Y'all don't really have a clue of what the hell U R talking about. Your comment on this issue make me feel that it is way above your pay grade. Stay in line. Shut the hell up you'll be better off. Reality is never a convenient thing. it's hard truth, that's why it's a complicated issue. But Haitians will make it through. I understand but he needs to know that the culture is also important because a kid who was borned and raised outside of Haiti wont really know the haitian culture 100%. They can find a way to integrate them but first they should make sure that they have a stable life in Haiti. He is right, being born on foreign soil doesn't make you less Haitian than those born in Haiti. Its a matter of technicality.